Profile: Long suspected of having one too many disconnected circuits in his logic center, Triggerhappy is a crazed, computerized creep who thinks everything is a big joke. Even in the midst of a raging battle, he's usually too busy laughing uncontrollably and drooling lubricant to look where he's shooting. Worse for him, he doesn't pay much attention to who's shooting in his direction either. He is seemingly intoxicated by the sounds of his own gunfire, staggering about blissfully as he blasts away. The occasional battlefield success he has is a result of the panic his wild shooting sprees sometimes generate among opponents. Those who've known him for a long time trace his erratic behavior back millions of years ago, to an episode in a Decepticon warrior-trainee boot camp: Triggerhappy was practicing the use of a proton machine gun while riding a hoverboard. He slipped and fell on his head, all the while firing wildly away. A half dozen of his teachers were unintentionally disintegrated. Fearing the worst, Triggerhappy was happily surprised when the camp's commander lauded him for his lethal expertise and graduated him on the spot. He has adopted that manic offensive strategy ever since, although no one is sure if he acts this way because of his initial success with it or because the bump on his head shook a few wires loose. Triggerhappy is paired with Blowpipe, the conniving, envious brother-in-law of the evil Nebulan group's leader, Lord Zarak. On Nebulos, Blowpipe managed Lord Zarak's political career and was chiefly responsible for arranging his rise to fame and power. When Lord Zarak fell from grace and allied himself with the Decepticons, Blowpipe thought it prudent to follow, so he did. Abilities: Triggerhappy transforms to a turbo-thrust jet fighter, with a maximum speed of 1980 mph and range of 4,000 miles. He's equipped with two twin side-mounted, rapid-fire photon pulse guns, used mostly for attacks on other flying craft. 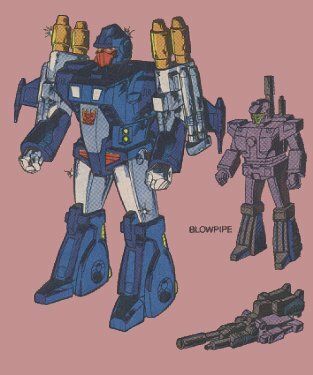 Blowpipe is bio-engineered to have the ability to convert to a powerful compressed air cannon, which Triggerhappy wields in robot mode. Weaknesses: Needless to say, given the wasteful manner in which he uses his weapons, Triggerhappy often finds himself out of ammunition during the most inopportune occasions - such as in the middle of a full-scale Autobot counterattack.